Sholay is a movie that needs no introduction to Indians. Labelled as a curry western by foreign media, the movie remains the all time blockbuster with supremely well written sequences, great characters enacted by aptly cast actors, a fantastic screenplay with almost every dialogue being remembered by fans and great songs. Sholay was the first movie where you used to get audio cassettes with only the dialogues. Although more than eight scenes come to my mind when I think Sholay, I would focus on the opening action sequence as something that sets the movie apart. Sholay was India's first movie shot in 70 mm stereophonic sound . This gave the opening action sequence a pulsating racy impact. It had camerawork that gave us the long shot expansive view of the landscape and how the dacoits approach the goods train. At the same time it created the intensity of a fist fight when the actors were shooting at the dacoits and still the train was moving at a fast pace. No wonder this sequence took 7 weeks to shoot and was enabled by a foreign crew. 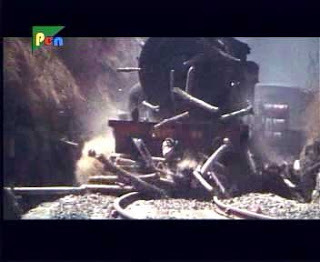 The following picture of the scene were the train powers over the barricade made of wood and tree trunks laid by the dacoits shows the power of the scene.The background music provides the throbbing pace, and the inventive nature of the fighters Jai and Veeru saves the train from getting captured. Sholay was the first movie I saw in the theater with my dad, the sound of the guns and horses was just so awesome. Inspector Thakur Baldev Singh is carrying 2 petty crooks to prison. The goods train they are traveling in , is attacked by dacoits. Realizing that he wont be able to save himself alone, he asks them for their help. The first scene is about their negotiation with him where Veeru ( Dharmendra)the extroverted one claims that they have seen the inspector before. Jai ( Amitabh ) says he finds every policemans face the same. Realizing they are capable, the inspector enlists their help but tells them they shouldnt escape. 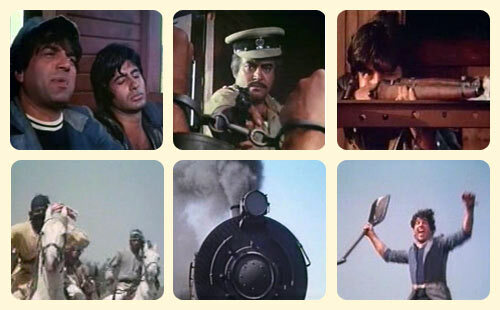 Valiantly they fight off the dacoits, watch out for the scene where the train powers through and Amitabh turns over after killing a dacoit . Its difficult to review a Rajni movie , if you are a fan you will watch it anyway. Its beyond reviews. But a PA Ranjith movie can definitely be reviewed. 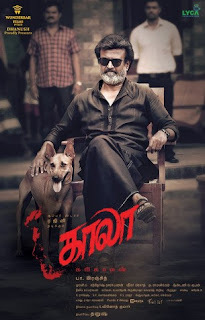 This is the conflict - what kind of Movie is Kaala? Is it a PA Ranjith movie or a Rajni movie or a Rajni blockbuster movie. Bucket List ReviewLike the title of the movie and it’s content , we seem to be part of Madhuri Dixits sorry Nene’s bucket list to do a Marathi movie without compromising on role quality, production house and impact. Playing a Marathi housewife with picture perfect ease in the richer surroundings of Prabhat Road Pune is not really a difficult role for Madhuri in a well funded production. The movie is less a movie but a Long Aamhi Tumche Aahot( Hum Aapke hi hai ) warm welcome to Madhuri in Marathi cinema. It’s not gritty , it’s not sentimental , it’s not layered enough across any domain. Actors of Dilip Prabhavalkars capability are given lesser footage as the upholstery of the house. Officer Teaser review: Intriguing Teaser but will the plot have sufficient layers? The biggest question to someone who grew up in the 80s in India is will RGV ever come back to the days he gave us Shiva, Satya, Ab Tak Chhapan or atleast a Sarkar ? He will never be able to give us a Rangeela because he refuses to give space to the others craftsmen who make a movie memorable. The actors intensity to do something different, the script writer, the choreographer , the cinematographer. He has made himself without the company of master craftsmen. So what he is left with is his astute sense of how a crime drama should be made. This is what we are still wondering. There are others who are already helming crime masala dramas better than him - Puri Jagannadh and AR Murugadoss in Tamil. So the question is does he have it? In Officer - he gets back an A+-grade Actor Nagarjuna - the man whom he started his journey in Shiva. They are re-uniting after 25 years! !